Occasionally as supporters we get the chance to gloat over the suffering of our rivals. Yesterday at Celtic Park we were too busy celebrating out seventh title in a row to care about the opposition. Having missed the chance to seal the title at Easter Road last week, the stage was set to do it at Paradise. The opposition was of course our new friends from Ibrox. I don’t need to spend much time talking about them because we all know how poor they are. It’s just that most of the media don’t seem to accept or admit that yet. Take nothing away from Celtic though. They put the visitors in their place quickly. The Bhoys were in scintillating form. It was apparent from the get go that they would not slip up as they did to Hibs the week before. Every Celtic player put in a shift. Not just to close down but to keep up the pressure. Wave after wave of attack looked promising. Celtic were having it their way and then some. The team were ticking over nicely. I’m confident that if there had been more of a presence to our visitors we’d have snuffed it out quickly. They had a few chances to do something but nowhere near enough to trouble Celtic or to change the outcome. From back to front the Hoops were solid. It was so one sided even Scott Brown was having a quiet match. Celtic’s player of the year didn’t even need to flex his muscles. The truth was that this was a game of attacking football. Celtic players were practically queueing up for chances to score. Had it not been for the heroics of Jak Alnwick in goal it could have been much worse for the visitors. And yet, it was still bad. The free reign Celtic had on their own turf coupled with a near flawless performance must have hurt badly for the away fans. Especially when it had sealed seven titles in a row. From this position, Celtic are in the driving seat to achieve even more. The Scottish Premier League has yet to provide a serious challenger since the demise of Rangers 1872. Rangers 2012 might be the club to take up that role eventully, but right now they are nowhere near. Despite their league position I don’t even think they are as good or even have the personnel that some other Scottish clubs have. They are pretenders, living off loans and lies. As much as they chant about being “the people” they are very far from supremacy. Celtic or their fans have never claimed to be anything other than a passionate. Today we are living the dream with big aspirations. It is hard to see how that will be challenged any time soon. Sunday proved that. To top it all off, Scott Brown and Kieran Tierney swept the PFA and Young PFA Awards at last nights ceremony. The young Celt also picked up goal of the season as well. Now it is time to push on with our new plans. A few more league games and then a chance to make more history against Motherwell at Hampden later this month. This is how it feels to be Celtic. Champions again as you know. There aren’t many players that give ten years of their playing career to a club these days. And there certainly isn’t another player like Scott Brown. Before he joined Celtic, Broony had already made a name for himself at Hibs. I recall the player in regular midfield tussles, particularly between himself and Neil Lennon in the mid-00’s. When Gordon Strachan signed him for a Scottish domestic record I never knew what sort of career he would carve out at the club, but I was pleased he was coming to Celtic. Young, talented and a little bit fiery. When you consider it cost Celtic £4.4M to sign him, it’s been money well spent. Especially for a decade’s worth of service. In that time he’s served under five different Celtic managers. Strachan, Mowbray, Lennon, Deila and now Rodgers. It hasn’t always been plain sailing for the Dunfermline born midfielder. He’s had to prove himself over and over again. Yet, he has always stuck by his managers. With the exception of Tony Mowbray perhaps. His maturity at Celtic will be part of his legacy as is his rise from understudy to club captain in the space of three years. Broony didn’t have everyone convinced though. Plenty of the Celtic support have cast their doubts about him from time-to-time. I wouldn’t disagree that some of the time they were even right. I’ve always tried to look at the bigger picture though. There are always factors in a player’s life we know nothing about which can affect their game. They can go from great seasons to not so great seasons. Injuries, poor form and suspensions…that’s a football career for you. Broony has always done his talking on the park first. By doing so, he’s afforded himself the luxury of being able to challenge people off the park including players, managers, officials and pundits, but only secondary to doing it on the field of play. He’s a smart guy, speaks well in the media and has learned how to conduct himself in one of the hardest roles in football. The craft he learned at Hibs developed at Celtic and he deserves praise by remaining committed to Scotland’s biggest club. Despite a number of attempts he was never lured away from Celtic. He valued what he had as captain of a special club and stayed to build upon that. He’s outlasted most and become a club legend in the making. There is no other player quite like him and right now he is playing the best football of his career. I don’t recall any Celtic player making me laugh like he does. Except perhaps maybe Frank McAvennie or one of the Lisbon Lions. For all he might have his detractors, he is head and shoulders above any active Scottish footballer today. He’s had the armband for club and country and the silverware to back it up. When rubbing shoulders with the giants of Europe he’s come off better and worse. That’s helped round him into the professional he is today. His swagger and style is recognisable particularly to those he winds up, but he isn’t a dirty player. He also has the skills to pay the bills and that is why he is still at Celtic. 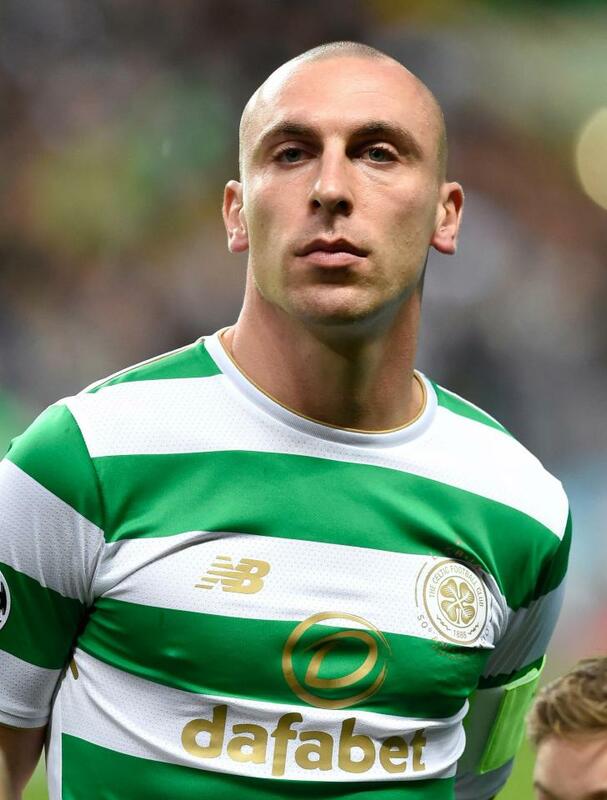 Every team in Scotland would die for a Scott Brown in their ranks. There’s only one available though and he’s ours. By the end of this season he will have completed ten years at the club. May 29th to be exact. In a season that hasn’t quite matched last seasons invincible run, Broony has been a mainstay. Since Brendan Rodgers arrived, he’s been a standout out for his manager. This season he’s been different class though. That was reflected by being voted the club’s Player of the Year. Now he is on the shortlist for PFA Player of the Year as well. Despite the noteworthy competition of Kris Boyd, John McGinn and fellow Celt, James Forrest, you cannot argue about Broony’s application this season. Looking over his Celtic career, he has produced 30 or more appearances each season. That’s taking into account injuries and suspensions, but he’s also managed to score every season….except this one. So I guess that means you’ve got five matches left to keep your record up-to-date, Scott? Tell you what, how about Sunday? I’m glad you chose Celtic, Broony. I’m also glad you decided to make a career of it with the club as well. Our captain, our leader. I’m glad he’s our Bhoy. More happy times ahead. For Broony and for us. I’ve mentioned in recent weeks about other Scottish teams that have impressed me this season. One of those teams happened to be Hibs. So it came as no surprise when they beat Celtic on Saturday lunchtime at Easter Road. It means that the title Champagne is on ice for at least another week now. Before this match I warned that Neil Lennon wouldn’t want to be the manager to hand the title to Celtic. Aside from being a servant for almost 15 years at Celtic, his current job has it’s own demands such as a European place. And that’s just what Hibs took another step closer to making a reality. By defeating Celtic, one of only three Scottish clubs to have done so this season so far, Hibs have put pressure on Rangers who today will host Hearts. There was of course disappointment at the manor of this loss. Both teams had come out of the blocks and were sluugging it out. Celtic struggled for composure in the final third of the park. As the match wore on, Hibs determination was shining through. The previous week’s evidence of what Celtic can do when in the mood was absent in Leith. Take nothing away from Hibs though, it was a fine performance from start to finish. They’ve come close to beating Celtic this season and have the fewest amount of league defeats next to Celtic. Now they finally got the victory they’d deserved. Although not Celtic’s best game it was a good match. Certainly a good advert for the Scottish game. A neutral would have enjoyed this one. A real end-to-end, fist fight of a match. I was very impressed with Kristoffer Ajer in this game. He’s developing into a fine player. Naturally I was disappointed with the result though. What it does set up is a fixture that the governing bodies and police had planned to avoid. With Aberdeen beating Kilmarnock on Saturday afternoon, the mathematical possibility of Celtic losing the title remains. Whether Rangers beat Hearts or not matters little at the stage. So that means Celtic could clinch the title next Sunday in front of their home audience. That would be an unpleasant day for Rangers fans. There is however, a slim chance the title could be decided before then. If Rangers got anything but a win today at Ibrox, the title could be clinched if Aberdeen lost to Hearts next Friday night. Celtic won’t be looking at that though. They’ll be focusing on their own game. A week ago Celtic wiped the floor with Rangers at Hampden to reach the Scottish Cup Final. Now they’ll want to do something similar to wrap up 7-in-a-row. We know Police Scotland wanted this situation to be avoided. That has completely backfired now. There’s no guarantee that Celtic will win of course. The unthinkable is always possible though. It’s actually turned out how many Celtic fans wanted it. Now Brendan Rodgers must do what he’s failed to do since September 10th 2016 – beat Rangers at Celtic Park. We know it’s coming. We just don’t know when. Today, Celtic travel to Easter Road to face Hibs in the first of five post-split fixtures. It’s also the first opportunity for Celtic to seal the title. Neil Lennon is a diehard Celt at heart, but he won’t want to be labelled as the guy who handed his old club their 7th league title in-a-row. He may be sentimental, but he has his hown reputation to consider. Besides, it doesn’t work like that. Hibs have their own battle. A win for Hibs would put them on 33 points. That’s what Aberdeen and Rangers are currently on so there’s an incentive to finish higher. Brendan Rodgers has had some of his toughest matches against Neil Lennon’s Hibs. I still admire Neil for who he is and what he has done for Celtic as a player, coach and manager. More importantly, the abuse he endured during his time at Celtic. I’m sure it still happens to this day. If Celtic play today like they did last week, they will be hard to stop. This will be a good match. I don’t mind if the Champagne goes on ice for another week. I’d still be over the moon to take it now though. I guess there isn’t long to wait until we know. All the best Bhoys. A few people have been getting hot under the collar about Dermot Desmond. After comments made by the major shareholder that he wouldn’t stand in the Brendan Rodgers’ way to talk to Arsenal, some supporters have been showing their dismay. It isn’t the first time Rodgers has been linked away from the club. Martin O’Neill went through the same rigmarole during his time at the club. The landscape has changed since then and the way to deal with these stories is to let them play out. So I have no issues with Desmond being open about it. Brendan has rebuilt his reputation after exiting Liverpool. He had a good spell there and people are adding that to his domestic success at Celtic. If Arsenal truly do want Brendan as Arsene Wenger’s successor they might want to see him prove his worth in Europe first. At Celtic he’s made slow progress in that area and a little more with Liverpool. That isn’t to say that with a bigger budget and more options in the transfer market with Arsenal he couldn’t make a success of it. If he had fewer limitations at Celtic, he might even close that gap with Europe’s elite clubs. As Dermot said though it’s up to Brendan. Furthermore is whether there is even any genuine interest. I’ve always maintained that Arsenal would probably go contintenal again. No offence to Brendan, but all the top clubs in England have foreign coaches. Do Arsenal see Brendan as the man to take on Conte, Guardiola, Mourinho and Pocchetino? I dont. Brendan can cut it in England as he’s shown, but clubs like Arsenal will be looking to win the league and progress in Europe. Brendan came close with Liverpool, but he still didn’t win anything. What Liverpool probably should’ve done was stick by him. I’m not even sure if Arsenal fans are in favour of the rumoured story. If the club were willing to stick by him then yes, I think he could do a good job in London long-term. My instincts tell me that they’ll go contintental though and aim to make an immediate impact. Arsenal have lost ground in Wenger’s later years. His exit is long overdue. We all know that Brendan won’t be here forever. I don’t think he’s going anywhere yet though. He’s already writing history at Celtic Park and there is more to come. And let’s not forget, he’s signed on for five years and he can still have his day in the south or overseas after he’s sealed 10-in-a-row. Sure, he can be bought out of his contract if required or he might even have a release clause. Does he want to walk away now or finish off the job he started though? I don’t think he’s going anywhere just yet. On Sunday I had pleasure of attending the Spirit of ’67 Worthing Celtic Supporters Club. Given the general accent of those in attendance, it felt like I was back in Scotland. Tam, Fee and all the Celts there made me and my small crew feel very welcome, laying on food as well as some brilliant banter. We even had a sing song afterwards. I couldn’t have picked a better place to watch Celtic smash the zombies into the Hampden turf. And that’s just what the Bhoys did. We’ve never stopped hearing “The Rangers are coming.” If it hasn’t been their fans it’s been the media. The so called title challenge has been anything but that. Celtic haven’t been as good as they were last season – we know that. Though this fact has never been taken into account when playing this mob. Even then, Celtic have only been overturned twice though never by our Glasgow rivals. And this is important to factor in when assessing your own progress. Because when you consider that Celtic didn’t start well in the last game at Ibrox, came from behind twice and eventually won the match with 10 men you have to recognise the difference in quality. There is no title race and the last opportunity for silverware at Ibrox this season was snuffed out by a Celtic team very much on their game yesterday. Celtic had a few lapses in concentration by those who for me cannot be considered first choice any more. Still, Graeme Murty’s side couldn’t take those chances. Even if they had, Brendan Rodgers players were in total control throughout and that’s the difference. So it should serve as a reminder to the blue half of the city, who cheered when they were drawn against Celtic, that they are way off the pace when faced with a fully loaded Celtic side. The evidence was on show for all to see in glorious HD. So now Celtic have a date in the final. Once again they will face Motherwell in a cup final. Having wiped the floor with Derek McInnes’ Aberdeen, Stephen Robinson has taken his physical and ruthless side to another Hampden final. There will be further determination to right the wrongs of the League Cup Final at the end of last year. Motherwell are not a team to take lightly. Celtic may have won the last final, but there is sufficient evidence from previous meetings this season to suggest the Steelmen are a credible threat. Along with Steve Clarke’s Kilmarnock and Neil Lennon’s Hibs, I rate these clubs to put pressure on Aberdeen and Rangers next season. I’ve been impressed by all three managers and their teams this season. For now, a place in the final has been firmly established by a clinical performance from Celtic. On Saturday they will travel to Easter Road to try and secure their 7th title in a row. Hibs will be no pushovers. They’ve already held Celtic twice this season to 2-2 draws home and away. Celtic won the last league encounter as well as beating Hibs in the League Cup. There’s a confidence and determination from Lennon’s side though. They’ve scored six goals in four games against Celtic drawing blank only once. So if Celtic are to win the league this Saturday they’ll have to be at their best. Failing that they can always do it at home against our friends from Ibrox the following Sunday at Celtic Park.